Grab your stick, helmet and pads and come jump on the ice. Times subject to change please be sure to always check our live ice schedule. Stick & Pucks is like an “open gym” except designed for hockey players. It is a loosely supervised session that allows players to practice skating and puck handling. 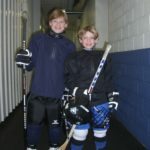 There are limitations to what you can and can’t do on the ice, but if you’re just looking for some extra time to enhance your skills, Sticks and Pucks is the place to be. Open to all ages. $12 per skater. Punch cards are available for $100 for 10 hours. Click here to purchase online. Pond Instructors use the ice for FREE. All other coaches pay for ice time.